Home Articles How much does a bidet cost? As you may have already noticed from your own shopping around, bidet toilet seats can cost as little as $300 to as much as $1,000 for an electric one and about $25 to $100 for a non-electric one. Given the wide range in prices, how much should you be spending on a toilet seat? The answer is that it will totally depend on what features you are looking for. Once you understand what features you are looking for in a bidet seat, you can better narrow down your choices and get a better idea of what it will cost you. When it comes to electric toilet seats, the more you pay the more comfort you get. Every additional “comfort” feature will cost you a bit more. 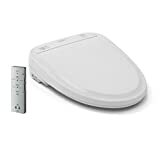 Some of the best electric toilet seats starting at around $300 are already equipped with must-have features like a heated seat and warm water wash. Those, but not all, even have an air dryer. Then as the price increases, you will get other “comfort” features like a deodorizer to help you keep the toilet smelling fresh or a detached control that you can hang anywhere you want to operate the bidet. Luxury bidet toilets such as this amazing Toto Washlet s350e have an automatic open and close toilet lid and a night light. It is also able to clean itself using electrolyzed water – a safe and effective way the hotel and food industries use to clean. The Toto s350e has all the features ever imagined for a toilet seat, so while it is super comfortable to use it also comes with a higher price tag. We consider the Toto s350e the absolute best bidet on the market today and the price tag for this bidet is around $1,000. For comparison purposes, a complete Toto toilet and Washlet unit (not just the bidet seat but the whole toilet unit combo) costs around $2,000, and the average electric bidet seat costs $500. Now, we’ll go over 3 excellent electric bidet choices in 3 different prices ranges. We’ll also give you an idea of what kinds of features they come with at their respective price ranges so you can use that as a guide. A great budget bidet seat is the Toto Washlet A100. It features a heated seat and customizable warm water wash. Since inventing the bidet seat, Toto continues to be one of the top brands making them. So even though the A100 is very basic you will still be purchasing a reliable, quality product. If all you need is something with a heated seat and warm water wash, the A100 is the perfect choice. But if you want to include an air dryer and deodorizer for some added comfort, the Toto C100 is another great bidet that is just a step up from the A100. 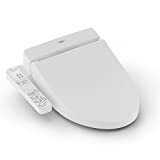 A midrange toilet seat that we would like to recommend is the Brondell Swash 1000. It has a heated seat, customizable warm water wash, air dryer, deodorizer, and remote control. While it is not as well known as the Japanese toilet seat manufacturer Toto, Brondell, hailing from South Korea, makes quality bidet seats nonetheless. As we mentioned earlier, the Toto s350e is one of the finest toilet seat bidets ever invented, so it’s only natural that we picked it as our choice for luxury bidet toilet. With the s350e, you will get a heated seat, customizable warm water wash, air dryer, deodorizer, remote control, electrolyzed water sanitation, automatic open/close lid, and night light. There’s nothing a toilet seat can do that it can’t. And did we mention it looks great? Most people opt for non-electric toilet seats because they are extremely affordable. If you just want something simple to wash with, non-electric bidets are an excellent choice. These bidets, however, do not have built-in heaters like the electric bidets have. So unless you use them with an existing hot water supply, they will only be able to spray cold water. Because they are “non-electric” they do not have the capability of heating the toilet seat either. So no heated seats! As we did with electric bidets, we’ll go over 2 non-electric bidets at 2 price points. A very basic but excellent non-electric bidet seat is the Astor CB-1000. Besides the price, it’s a great bidet seat because it’s easy to install and simple to use. It has great water pressure too. You operate the bidet using a dial. If you only need something to wash with, and don’t care about warm water or heated seats, then go for the Astor bidet. If you want a non-electric bidet seat with a bit more comfort, the Luxe Bidet Neo 180 features dual nozzles for rear and front wash. The nozzles are protected by a cover from unwanted splashing. The nozzles also have a rinse feature to keep clean. This bidet seat is operated by a lever instead of a dial. Just like cars, the cost of a bidet can vary greatly. Now that these heated toilet seats are getting more and more popular, there is a bidet seat for everyone at various price points. If you’re unsure what features you want, we recommend going to your local specialized toilet and bathroom retailer and talking to the staff to get some opinions. It would also be a great idea to check in with family and friends who have a bidet seat and ask about their experiences.